The watercress is considered a major source of vitamin A, essential for the eyes and for the skin. It also has a high potential for minerals such as iodine, sulphur, calcium, and phosphorus, but mainly iron. 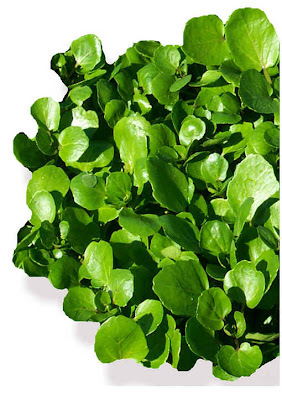 As the watercress is low in calories, and virtually has no fat, is an excellent food for people on a diet. It also has tonic and stimulant properties, which make an optimum food to stimulate the appetite –this is why it’s recommended to serve it as a first plate, in the form of salad, especially on hot summer days, Watercress is very refreshing. Medicinal Properties: Baldness, Skin Clarifier, Scurvy, Bronchial Disorders, Infertility, Tuberculosis Infection, Blood Purifier, Kidney Problems, Cancer Relief, Cures Kidney Stones, Rheumatism, Gum Strengthening, Hair Growth Skin Potions, Acne, Asthma, Hunger and Focus.